A holiday in style, suitable for large groups. 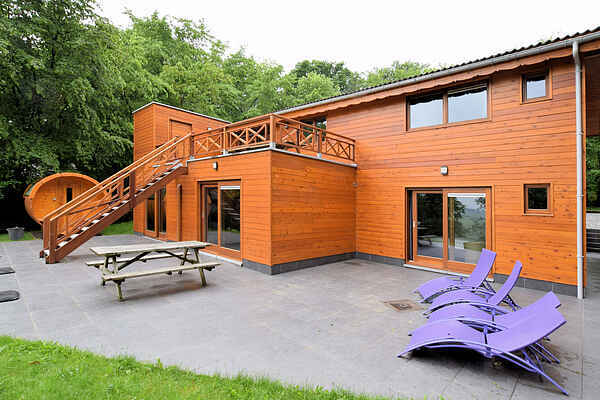 That's what you can expect from this luxurious, large chalet. When the house was built, the owner paid a lot of attention to detail and quality and you can see this in every aspect. And that's not all; when it comes to amenities, you'll find everything you could wish for: all bedrooms are fitted with en-suite bathrooms and there's an indoor wellness area with infrared sauna and jacuzzi. There's also a traditional sauna outdoors. This means you can have a very comfortable stay here in winter. And in warmer weather, you can extend your living space by opening the doors to your balcony/terrace and the garden, where everyone can have breakfast, lunch or dinner together. Or just relax with a glass of wine or a Belgian beer of course. Have we mentioned all the great things about this house? Not quite - there's still the magnificent view across the hills of the southern Ardennes! You'll realise exactly how far south you are here when we say that the French border is only 100 metres away. A perfect location from which to explore the area!